The Museum of Egyptian Antiquities, known commonly as the Egyptian Museum, in Cairo, Egypt, is home to the most extensive collection of ancient Egyptian antiquities in the world. It has 120,000 items, with a representative amount on display, the remainder in storerooms and parking lots. The museum's Royal Mummy Room, containing 27 royal mummies from pharaonic times, was closed on the orders of President Anwar Sadat in 1981. It was reopened, with a slightly curtailed display of New Kingdom kings and queens in 1985, along with the reconstructed Royal Tomb of Akhenaten in the museum's parking lot. As with valuable historical artifacts and cultural treasures of other non-European countries, numerous items were taken outside of Egypt by colonial powers and became the property of foreign museums. Other notable Egyptian Museums include Museo Egizio (Egyptian Museum of Turin) in Turin, Italy and Egyptian Museum of Berlin in Germany. In Egypt, the third and final phase of construction of the Grand Egyptian Museum in Giza is under way (opening expected in 2015). The Egyptian Museum of Antiquities contains many important pieces of history. Not only does it house the world’s largest collection of Pharaonic antiquities, it also houses the many treasures of King Tutankhamen and many interesting statues that moved with the museums many relocations. The Egyptian government established the museum in 1835 near the Asbakiya Gardens. The museum soon moved to Boulaq in 1858 because the original building was too small to hold all of the artifacts. In 1855, shortly after the artifacts were moved, Duke Maximilian of Austria was given all of the artifacts. He hired a French architect to design and construct a new museum for the antiquities. The new building was to be constructed on the bank of the Nile River in Boulaq. In 1878, after the museum was completed for some time, it suffered irreversible damage; a flood of the Nile River caused the antiquities to be relocated to another museum, in Giza. 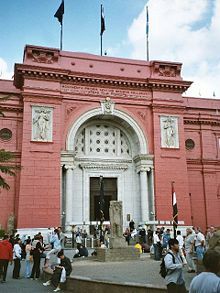 The artifacts remained there until 1902 when they were moved, for the last time to the current museum in Tahrir Square. There are two main floors of the museum, the ground floor and the first floor. On the ground floor visitors will find an extensive collection of papyrus and coins used in the Ancient world. The numerous pieces of papyrus are generally small fragments, due to their decay over the past two millennia. Several languages are found on these pieces, including Greek, Latin, Arabic, and the Ancient Egyptian writing language of hieroglyphs. The coins found on this floor are made of many different elements, including gold, silver, and bronze. The coins are not only Egyptian, but also Ancient Greek, Roman, and Islamic, which has helped historians research the history of Ancient Egyptian trade. Also on the ground floor are artifacts from the New Kingdom, the time period between 1550 and 1070 B.C.E. These artifacts are generally larger than items created in earlier centuries. Those items include statues, tables, and coffins. If visitors follow these displays in chronological order they will end up on the first floor, which contains artifacts from the final two dynasties of Ancient Egypt. Some artifacts in this area include items from the tombs of the Pharaohs Tuhtmosis III, Tuhtmosis IV, Amenophis II, Hatshepsut, and Maherpen, and also many artifacts taken from the legendary Valley of the Kings. The majority of the world has come to know the tomb of King Tutankhamun better than any royal tombs because unlike the others, it was found mostly intact. Inside the tomb there is a large collection of artifacts used throughout the King’s life. These artifacts range from a decorated chest, which was most likely used as a closet or suitcase, to ivory and gold bracelets, necklaces, and other decorative jewelry, to alabaster vases and flasks. The tomb is also home to many weapons and instruments used by the King. Although the tomb holds over 3,500 artifacts, it should be noted that this tomb was not found completely intact. In fact, there have been at least two robberies of the tomb, perhaps soon after Tutankhamun's burial. The most well known artifact in King Tutankhamun’s tomb is the infamous Gold Mask, which rests over the bandages that wrap around the King’s face. 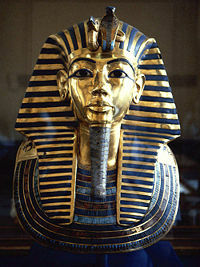 The mask weighs in at 24 pounds of solid gold, and is believed to represent what the King’s face really looked like. Many features of the mask the eyes, nose, lips and chin are all represented in a youthful way. 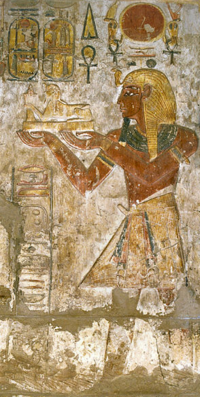 Cropped version of a relief from the Sanctuary of Khonsu Temple depicting Ramesses III. Lightly retouched in PhotoShop. A "Sphinx" is being offered. The remains of many famous Pharaohs are stored in the Egyptian Museum of Antiquities. One of these is Pharaoh Ramses III, who was an extremely skilled warrior and had an impressive army. For many of the mummified pharaohs, it has been very difficult to determine when they were born; historians can only estimate the time they reigned over Egypt. For Amenhotep IV, historians have estimated that he reigned around 1372 B.C.E. based on information about the death of Amenhotep IV's father, Amenhotep III. Also, that Amenhotep IV's tomb inscribed five names he gave himself and one of them, Golden Horus, reveals that he was crowned on the bank of the Nile. King Snofru was believed to have been the first king of the Fourth Dynasty. The year Snofru was believed to have started reigning over Egypt was around 2620 B.C.E. and is believed to have been a fair and just king. Snofru, like many other kings, built many temples and structures, which bore his signature of a statue of a woman. The statue of the young women is depicted presenting the sign of life and votive offerings, as well as the signs of the city and the stronghold. There are about four or five of these in each province. Egyptian statues in the museum. The Museo Egizio is a museum in Turin, Italy, specializing in Egyptian archaeology and anthropology. It is home to what is regarded as one of the largest collections of Egyptian antiquities outside of Egypt. In 2006 it received 554,911 visitors. The first object having an association with Egypt to arrive in Turin was the Mensa Islaca in 1630, an altar table in imitation of Egyptian style, which Dulu Jones suggests had been created for a temple to Isis in Rome. This exotic piece spurred King Carlo Emmanuele III to commission botanist Vitaliano Donati to travel to Egypt in 1753 and acquire items from its past. Donati returned with 300 pieces recovered from Karnak and Coptos, which became the nucleus of the Turin collection. In 1824, King Carlo Felice acquired the material from the Drovetti collection (5,268 pieces, including 100 statues, 170 papyri, stelae, mummies, and other items), that the French General Consul, Bernardino Drovetti, had built during his stay in Egypt. In the same year, Jean-François Champollion used the huge Turin collection of papyri to test his breakthroughs in deciphering the hieroglyphic writing. The time Champollion spent in Turin studying the texts is also the origin of a legend about the mysterious disappearance of the "Papiro Regio," that was only later found and of which some portions are still unavailable. In 1950 a parapsychologist was contacted to pinpoint them, to no avail. In 1833, the collection of Piedmontese Giuseppe Sossio (over 1,200 pieces) was added to the Egyptian Museum. The collection was complemented and completed by the finds of Egyptologist Ernesto Schiaparelli, during his excavation campaigns between 1900 and 1920, further filled out the collection. Its last major acquisition was the small temple of Ellesiya, which the Egyptian government presented to Italy for her assistance during the Nubian monument salvage campaign in the 1960s. Through all these years, the Egyptian collection has always been in Turin, in the building projected for the purpose of housing it, Via Accademia delle Scienze 6. Only during the Second World War was some of the material moved to the town of Agliè. The museum became an experiment of the Italian government in privatization of the nation's museums when the Fondazione Museo delle Antichita Egizie was officially established at the end of 2004. The building itself was remodelled in celebration of the 2006 Winter Olympics, with its main rooms redesigned by Dante Ferretti, and "featured an imaginative use of lighting and mirrors in a spectacular display of some of the most important and impressive Pharaonic statues in the museum collection." The Egyptian Museum of Berlin (German: Ägyptisches Museum und Papyrussammlung) is home to one of the world's most important collections of Ancient Egyptian artifacts. 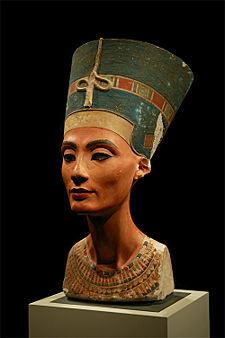 The most famous piece on display is the exceptionally well preserved and vividly colored bust of Queen Nefertiti. The collection was moved from Charlottenburg to the Altes Museum in 2005. The Grand Egyptian Museum (GEM) is sited on 50 hectares of land in Giza and is part of a new master plan for the plateau. On January 5, 2002 Egyptian President Mubarak laid the foundation stone. The museum site is two kilometers from the Pyramids of Giza. The building was designed by Heneghan Peng Architects, Buro Happold, and Arup. The first and second phases of the project have been completed and the third and final phase of construction began in 2012. On August 25, 2006 the statue of Ramses II was moved from Ramses Square in Cairo to the Giza Plateau, in anticipation of construction of the GEM. The statue will be situated at the entrance of the GEM. ↑ Massimiliano Vavassori. Dossier Musei 2007 (Italian), Touring Club Italiano. Retrieved June 19, 2008. ↑ 2.0 2.1 Dulu Jones, "Spectacular Turin: The reopening of the Museum of Egyptian Antiquities," Minerva 17 (May/June 2006): 10f. ↑ Starting the third and final phase of the Grand Egyptian Museum The Grand Egyptian Museum, News, March 12, 2012. Retrieved November 20, 2013. Jones, Dulu. 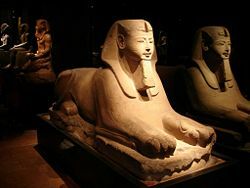 "Spectacular Turin: The reopening of the Museum of Egyptian Antiquities," Minerva 17 (May/June 2006). Salah, Mohamed. The Highlights of the Egyptian Museum, Cairo. Japan: Seibu Museum of Art, 1983. Vavassori, Massimiliano. Dossier Musei 2007, Touring Club Italiano. Retrieved June 19, 2008. This list only contains estimates of collection size, which may or may not reflect the collection's historical, scientific, or artistic value. This page was last modified on 19 September 2017, at 16:43.